Welcome to the haunted hovels section of haunted places in Virginia. Please select a link below to view information on that location. This section on Haunted places in Virginia is growing all the time and locations will be added frequently, so check back if you don't find what your looking for. Alternatively, if you know of a haunted location that isn't in the list, then feel free to submit one by clicking the above link. The Haunted hovel aims to have the most complete list of haunted locations on the web, so stay tuned, it'll be worth it. As with all other states, Virginia has been inhabited for quite some time. People first lived in the state since around 12,000bc and were of course native Americans. This leads to the most classic types of hauntings involving Indian spirits all over the state. The state also played a major part in the civil war. The state allied itself with the confederate forces except west Virginia which remained union. During the war, more battles were fought in Virginia than anywhere else, including Bull Run, the Seven Days Battles, Chancellorsville, and the concluding Battle of Appomattox Court House. Because of its history, this state paves the way for many a ghost tale. The ghost of a young woman haunts the inn and is believed to be looking for her lover. Sightings are so common that they at one time they charged extra for her "favorite" room. Alexandria INOVA hospital is built on the site of the Vauxcleus mansion, an ante-bellum plantation mansion. During the Civil War a Confederate soldier was seen and shot dead by a Union picket while sneaking up the ravine to visit a girl friend in the Vauxcleus mansion. Since, it is said you can see his ghost moving through the woods on moonlit nights. People have reported seeing things, hearing strange noises. And a few people have reported coming down the steps and seeing a woman's reflection in the window. Mary Branch girl's dormitory has had doors opening and closing by themselves, items disappearing/reappearing, etc. Washington-Franklin Hall has at least two ghosts that have appeared to teachers on several occasions. This place is haunted by the ghost of a Civil War nurse who can be heard playing the piano at night. She has also been spotted walking the fields at night, still looking for wounded soldiers to help. Civil war soldiers can be heard calling out commands and then firing, also confederate soldiers have been seen walking through the graveyard behind the church. The church has also been said to be haunted. This college is supposedly haunted by the ghost of a young boy who died here. He is said to haunt the fourth floor, which is one of the women’s dormitories. The ghost can sometimes be heard riding his bicycle up and down the hallway. There has also been an unusual death every year since the college was built. This school is built on an Indian burial ground from Many years ago, there are Indians that appear and walk the halls mostly late at night! There is one that likes to appear in the gym very often! Reports of lights coming on at night and go off before the light switch is touched, witnesses see shadows of 3 women, and in the cellar baby’s cries are heard. a man who escaped from a mental institution hid in a tunnel under a bridge where he hung people. It is called Bunnyman because when searchers looked for the man they found the carcass of rabbits. His ghost still haunts the bridge and sightings of people seen hanging from the bridge are common. This was the last capitol of the confederacy. Jefferson Davis spent hours staring out the window of the parlor, after he heard the news of the surrender of the confederacy. To this day, you can take tours through the mansion, but the real tour is at night. You can hear foot steps, hear a young girl moan, see a young woman in mirrors, and smell cigar smoke. 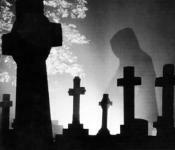 A report of a headless man walking around the cemetery at night. He might me looking for his head. Back in the 1960's, the principal of Longfellow suffered a massive heart attack and died in his office at the school. After hours, custodians and other faculty report seeing him walk around the halls, apparently looking for troublemakers - as he would do normally as principal. They also have reported doors shutting, lights turning off, voices, and other noises, all of which have no explanations. This school, reportedly, is one of the most haunted in all of northern Virginia. In 1995, a teacher even reported hearing a moaning and screaming down the hallways, with no one else around. Reports of dorm rooms opening by themselves as one was entering, feelings of being watched, radios changed stations, footsteps, and feeling a presence. On the coldest, wettest nights There has been at least two sightings by soldiers who regularly patrol the base of a mysterious ghostly being who allegedly disappears into the wetlands of this area. It has been said that this may be the ghost of a soldier who was stationed here who committed suicide by hanging himself about 5 years ago. There have been many sightings of a child walking in the graveyard behind Frederick Avenue. Also, some of the people in these houses on the avenue have sighted ghosts within their own premises such as children crying out to them. Along the old hall ways, lights flicker without electricity, foot steps are heard by people living around it, and a friendly ghost walks the girls bathroom at night. This hotel is on Fort Monroe. Apparently, when the original hotel burnt down, a young teenage girl went with it by accident. She was looking for her father who evacuated already. Employees on the seventh floor on where she died claim that they can still hear her banging on the walls, or catch her looking out the window. Just off Port Republic Road sets General Turner Ashby's grave across the road from Deer Run Apartments, a misty fog after 12am has been reported. It is said that a farmer believed his daughter was responsible for giving her mother spoiled meat that killed her so he hung his daughter from a meat hook on the fourth floor of their mill. Her image on the meat hook has been seen frequently. The mill was more recently burnt down. It is said that late at night you can see shadows carrying lamps walking through the woods. It is believed that it is the spirits of Indians from years gone by. The Mansion itself burnt down 30 some years ago, but it is said that if your in the area at night you will hear the sounds of slaves chained together, walking down the road. Not only that, but you will hear the slaves singing songs of their era. The tunnel was part of an old railroad system that ran from Lexington to Staunton in the early 1900s. Inside the tunnel at night, voices of children are heard whispering "Come on, come on." Misty dark fog gathers around you when standing in the middle of the tunnel. A painting over the alter has been said to bleed, noises in VMI's catacombs, old cellars under barracks, and sounds of cannon fire near the Jackson Memorial Hall. There is a ghost named miss Lucy who hunts rooms 51 to 54. She sometime push's people and is seen in the city tavern. Abijah Thomas built the Octagon house in 1850. Thomas built the house with 8 sides to protect it from wind damage. He kept slaves to help him work the fields. It is said that in an upstairs room you can still see fresh blood dripping and seeping down one of the walls. You can also hear many strange noises through out the entire premises. At the old high school it is known to be haunted in the theater. Lights move and cut off, doors shake and you hear many noises. There is also a cold chill when you call upon the ghosts. Also, banging noises on the door. This house has been here since the 1600's and its a three story there are carvings on the outside of the house of people how live in the house in the 1600's and 1700's there is a legend there was a solider hanged and shot on the stair way and they buried him out in the field now people who visit there see the ghost. Some people have seen Civil War soldiers on the battlefield near here. Some say their are nights in the month of May that the cannons can still be heard in the far distance, and many people have seen the charge of the cadets replayed in front of them. Many people have reported seeing a man walk the halls on various floors of this jail. The sightings are usually seen by the night shift, and are attributed to the natural death of a previous inmate. A girl haunts the women’s residency. She sits in a chair at night and follows anyone who comes in late or who gets up and walks to the bathroom where she supposedly had died. She is a mean ghost and has frightened many women at this college with her wicked stare as she follows them. Strange noises in vacant rooms. Footsteps have been heard on many occasions that belong to an unknown and invisible being. On occasion two confederate soldiers have been seen sitting under the big tree out front talking. Strange noises coming from upstairs while no one is up there. Music has been heard in the "main room". Described as violins. On a few occasions witness have described a man and a woman descending the staircase. It is said that late at night you can hear loud voices and sounds of cannons going off. There is also a ghostly figure that rides a black horse and can be seen on top of the hill just behind the station. If you walk in there you get a feeling that someone’s there. You can some times hear noises and maybe see something. The hospital has been closed down for a number of years and there’s no telling how many people have died in there. But some Spirits still remain. The new road was constructed over an old Indian Grave. Spirits come out around midnight near the tollbooth. There have been several reports of the spirits to the police. Toll booth workers say they hear strange noises at night. The museum is located on a Civil War battlefield; also the museum contains old planes and artifacts from pilots beginning in WWII. There have been other occurrences there such as footsteps to a particular plane, and a very old stopwatch starting up and ticking. the original owner of the old hotel in natural bridge supposedly went crazy and killed his wife and kids in the hotel and some people have claimed to have seen them wandering the grounds at night. But no one ever speaks of it because it will make tourism fall. Employees of the restaurant say that there is a ghost of a man who sits at the bar sometimes late at night when the restaurant is closed. He is believed to have drowned in the river behind the restaurant after leaving the bar one night. He just sits there drinking and staring off into space, if approached, he will disappear. It is said that there is a bloodstain in the foyer from a confederate soldier who killed himself after learning of his wife being unfaithful with a Yankee soldier during the battle of Stanardsville. Even though it has been scrubbed away at night each morning it returns. It is also said that he still wanders the halls with a pistol looking for the Yankee soldier. This is the place where Robert E Lee grew up and lived with his family. If you go in his wife's old room and see the bed made and then walk out for five minutes the bed will have a place where someone sat down. The places are different each time but it is said to be his wife's ghost sitting on her bed to think. Sometimes you can see a woman in a black dress come down the stairs. If you go into the sitting room you can see a picture of the same woman. Witnesses report being watched and felt very uncomfortable and scared. Flashes of light and shadows as well. The ghost of an ex-fireman has been spotted within the station. In some situations sirens are turned on by themselves, doors are slammed on vehicles, and fire alarms are raised for no reason. Ghosts of 17th century colonists killed in an Indian massacre roam the grounds. Fresh flowers wilt overnight in the 'refusal room', Pirates seen playing cards in the mansion at night. Williamsburg's first serial killer stashed his young victim's bodies here, and it is said to be haunted by them. This place has experieced many strange sightings threw the years. Many People have said they can see a strange figure standing in a window looking over the field. It has also been said that children that have been terribly murdered can be heard laughing and bouncing balls. Many peolpe have been heard screaming from the house with sheer terror.